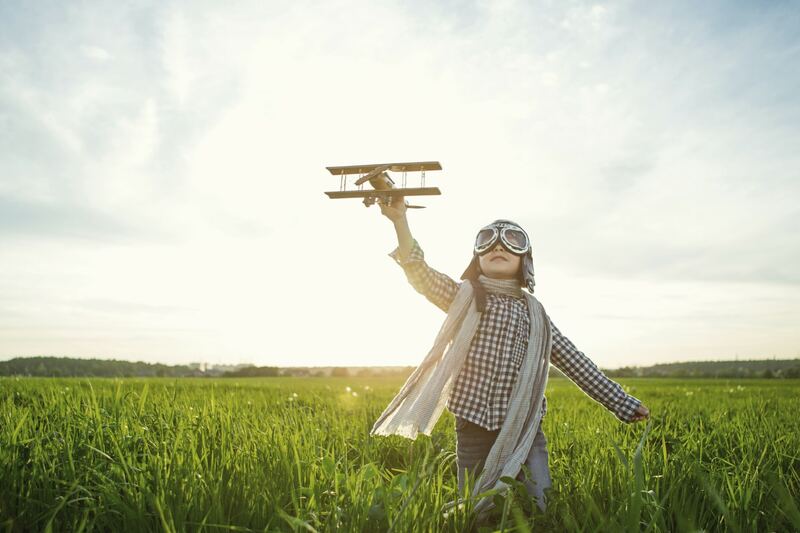 From incredibly wild landscapes and free places to roam to interactive and educational museums, Ireland is an amazing country to visit with kids. 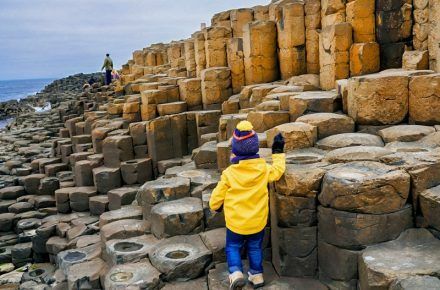 This is the ultimate guide to visiting Ireland with kids. If you’re planning a trip to Ireland with kids, I commend you on your choice! Ireland is an incredible country full of incredible landscapes, culture, and history. But what I loved most about Ireland was that children are accepted and loved. Especially having four children, you definitely get a sense of whether or not a destination is friendly toward children, and we felt all the love in Ireland! There are so many things to do in Ireland with kids that it can feel overwhelming to plan your trip. Be sure to read this guide to the best places to visit in Ireland so you can see which sites appeal to you and your kids. And ready this list of things to know about Ireland before you go. Don’t forget to use this $40 coupon for Airbnb! I hope this will be helpful in planning your trip to Ireland with kids. You’re going to have a fantastic time, but take a few minutes and read through this and come back here as you plan your trip and please ask for my advice! Ireland is one of my favorite countries and I really do love helping you plan your visit! Right now, Ireland is one of the cheapest European countries to fly to from the United States. We booked flights for $60 one way from Boston! I just saw flights for $450 from LAX and $370 from New York for this spring. There are always killer deals to Ireland and it is totally a place worthy of a few week visit if you can swing it. 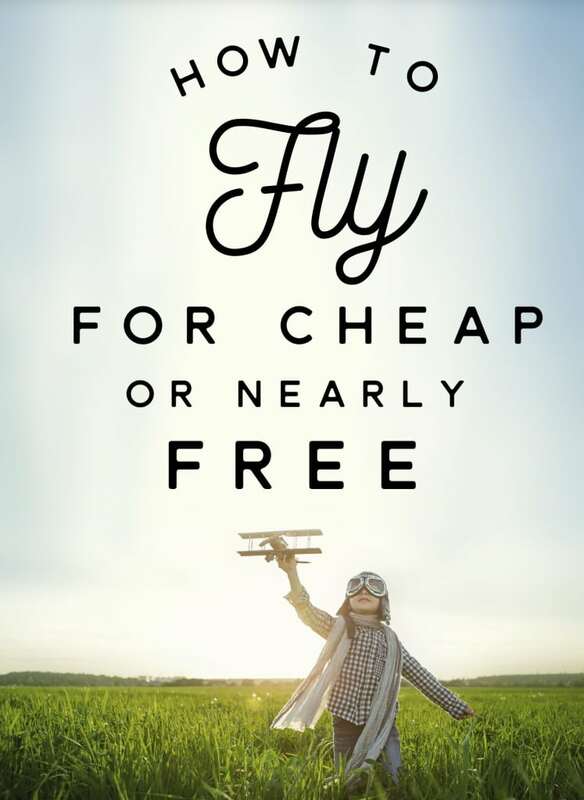 If you need help getting a good deal on flights check out How to Fly for Cheap or Nearly Free which is full of so much helpful information! Rain Boots: I would say that this is a necessity if you’re going to Ireland in ANY season. Its called the Emerald Isle for a reason…meaning, it’s green because… RAIN! I love these rain boots for my kids. Rain Coat: Again…the rain! You’ll need something to keep you dry. If you’re going in the summer, bring a light one like this one for your kids. I love all the color choices and the fact that it is cotton-lined and super waterproof! Grown Ups: Read here for a more detailed Ireland packing list for adults. 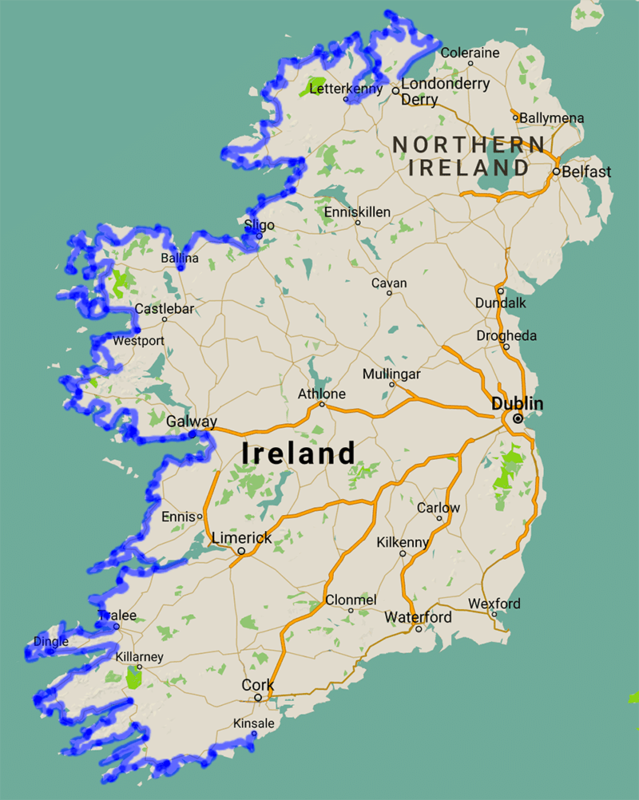 The Island of Ireland is divided into two parts (embarrassingly, I did not know this until we started researching our move there) Northern Ireland and the Republic of Eire. Northern Ireland is part of the British Commonwealth, follows the laws of Britain, uses the pound sterling currency and pays homage to the Queen; while the Republic of Eire also known as just “Ireland” is a separate country. 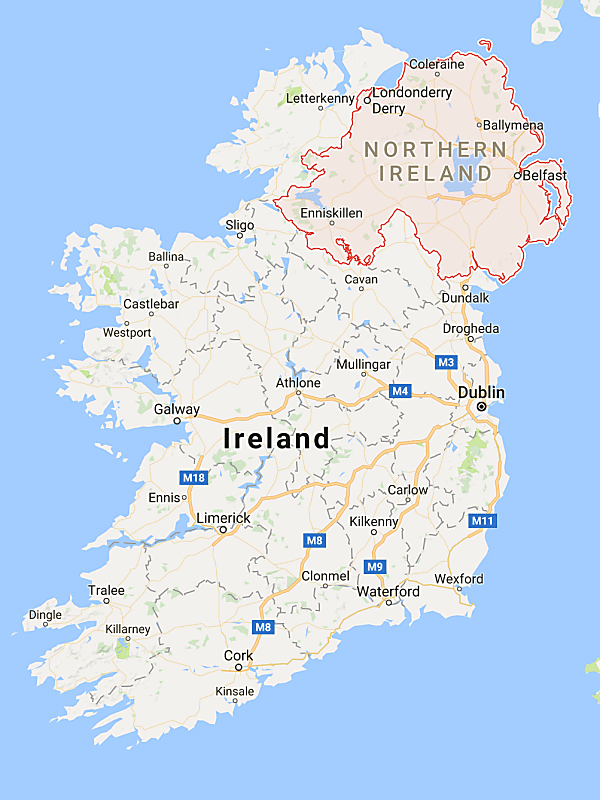 So when referring to the Northern part of the Island, be sure to specify “Northern Ireland” and when referring to the south it is referred to as “Ireland” (any Irish or Northern Irish people here, please feel free to correct me if I get any of this wrong)! Ireland has an ancient history and the island was invaded many times in the past, first by celts in 400 BC, by Vikings around 800 AD, and then by Normans from Britain in 1100 AD when the Anglo-Irish struggle began and will last until present day! Because of all these invasions, there are so many amazing artifacts and examples of Celtic, Viking and Norman life throughout Ireland. It is a truly fascinating history and worth reading about more in depth before you visit, unless this is enough for you, then carry on! If you want a more in-depth look at the history of Ireland so you can teach your kids, I really enjoyed this book. Before heading to Ireland with kids, it’s great to give them a little knowledge about the countries and culture you will see. It is so much fun to see their faces light up when they see something that they’ve read about in a book and making those connections will give them a better chance of remembering what they’ve learned in the books and on their trip. Worldschooling at its finest! These are some of our favorite books about Ireland. There are options for all reading levels below, including fiction and nonfiction. Some of these can also be found on Audible. One of our favorite things to do in Ireland with kids while driving on those beautifully scenic roads is to turn on an audiobook. It keeps the kids entertained and helps us all learn about this beautiful country while being there. 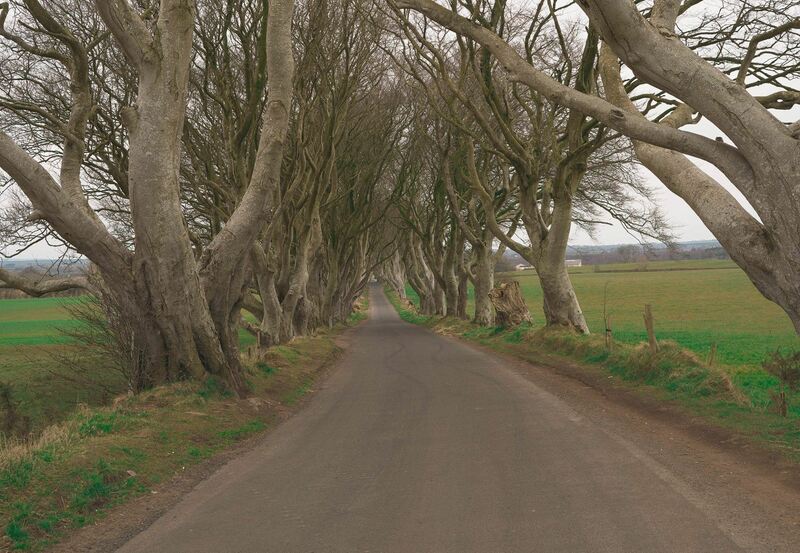 We listened to Patrick of Ireland: The Boy Who Forgave while driving through Ireland to learn all about St. Patrick while we were in Ireland for St. Patrick’s Day! Pretty cool huh? If you’ve been with us a while, you know that our favorite way to stay is Airbnb. If you haven’t used Airbnb before, read our 16 Rules for AirBnB. And if you’ve never signed up, you can get a $40 coupon here. There are lots of beautiful country cottages and adorable city apartments available in Ireland and Northern Ireland for reasonable prices. We found Ireland one of the more affordable places that we lived in. Northern Ireland was a little more expensive because the exchange rate for the Sterling Pound was not as good when we were there. That was before Brexit, and the exchange rate to the US Dollar is really good right now. Another reason to make a visit soon! We spent 2 months in a beautiful 200-year-old cottage in Saltmills Co. Wexford. Here is the link if you’re interested in staying. Jayne, our host, is an amazing lady. 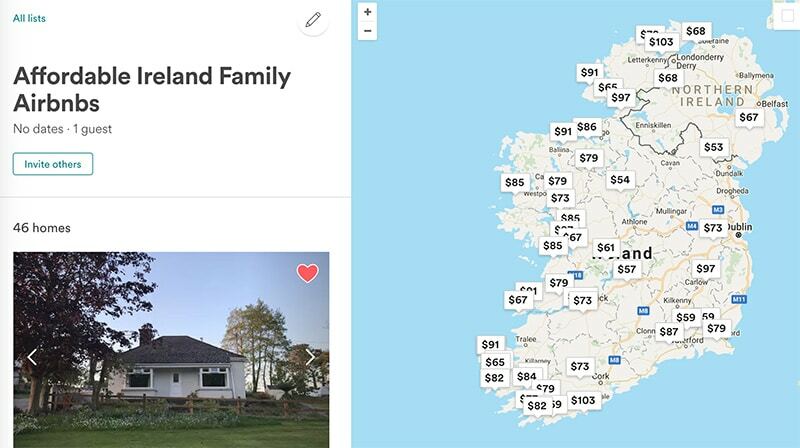 I’ve also created this Airbnb Wishlist of affordable houses for families across Ireland. 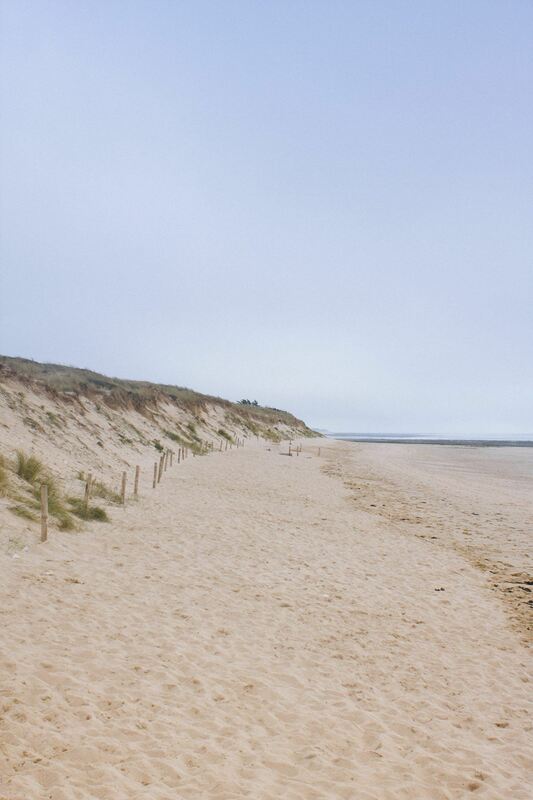 I’ve found hotels to be fairly affordable in Ireland and there are several that accommodate larger families, which I find so refreshing with 4 kids in tow! I have the best luck with Hotels.com and we get frequent free nights by using their rewards program. 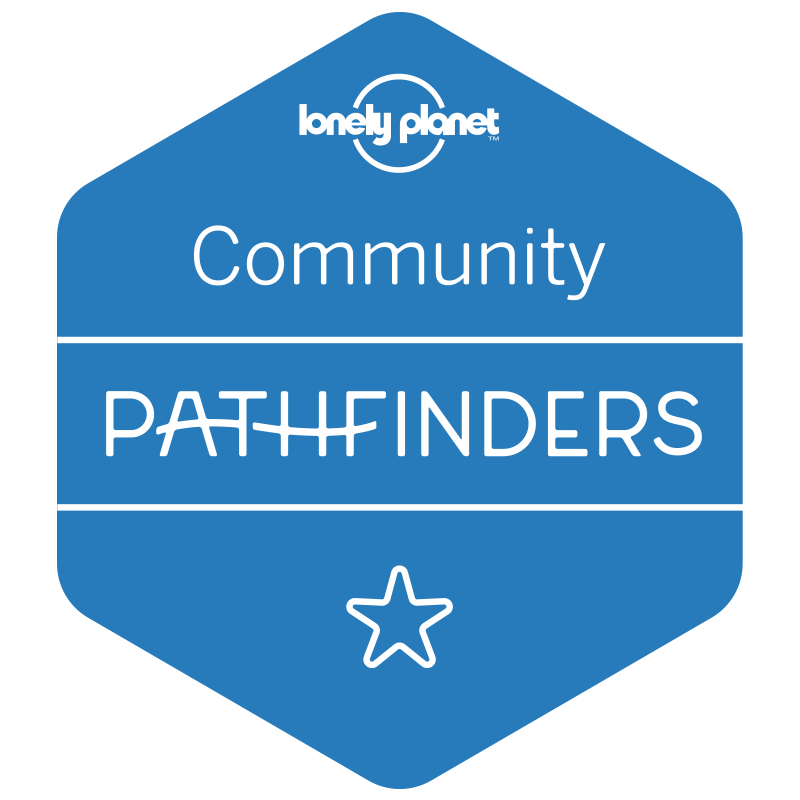 Enter the number of adults and children in your party and at the bottom of each hotel listing, you will see little head icons showing you how many the room can hold. Also, search everything in map view on Hotels.com and Airbnb to be sure it’s not too far from the places you want to see! Everything in Ireland LOOKS close, but many of the roads are small one lane highways or country roads so it actually does take a long time to get around. Powerscourt Hotel: This is probably the nicest hotel I’ve ever stayed in! There was a TV screen embedded into the bathroom mirror! So now you know how I rate the fanciness of hotels! We stayed here over Easter Sunday as our last stop before catching the ferry to France. There is a kids club where they held a little Easter egg hunt for the kids and the hotel is just gorgeous with plush beds and balconies with stunning views of the Powerscourt grounds. We actually stayed here for FREE twice using our Marriott Rewards points as the hotel is run by Marriott. Ashford Castle- This amazing luxury castle looks like a fairytale dream come true. I can’t afford to stay here, but read Travel Babbo’s review. They loved it and it looks worth every penny if it’s within your budget. Ireland, and Europe in general, is full of roundabouts. They are fantastic things that really help with the flow of traffic. In Ireland they will curve to the left. Most of the time they consist of several lanes. Be sure to follow the arrows or signs for which lane you need to be in. There can be anywhere from 2-6 or more exits on a roundabout and they can get pretty tricky. Just pay attention and you will be fine. Ireland is full of narrow roads with hedges or stone walls on either side. It’s an effort, but be sure to stay in your lane as to not graze the side of the wall or hedges with your car. You may come across quite a few one track roads. This means that there will be one lane shared by two directions of traffic. You will see “passing places” along all the roads where you must pull over and wait for cars to pass if you see them. Always pull over to the left. Never cross the road to pull into a passing place located on the right. There’s nothing more magical than being in a sheep or goat traffic jam! Just be sure to give them the right of way and pay attention. With all of the narrow roads, stone walls, hedges, small parking spaces and new left driving orientation, I always recommend that you get the full insurance on a rental car. Alternatively, look into your credit card as some cards, such as Chase Sapphire offer full rental car insurance in foreign countries. Be sure to bring along proof of this for the rental car company. Ireland is a relatively small island, but because it offers over 900 miles of coastline and centuries of history, it would take you a lifetime to see it all! You may want to break down your visit to one or two sections of the island, or if you’re feeling ambitious, you can follow my Perfect Ireland Itinerary. I suggest that if you’re traveling with kids, especially kids who don’t love road trips, sticking to one or two parts of the island. I’ve broken Ireland down into the East, West and Northern Ireland just for the sake of simplicity. Read through these and see which one offers the most for your family. It’s not really fair to play favorites when it comes to Ireland. It really is all entirely beautiful and magical, but Ireland’s Ancient East was our home for 2 months and we absolutely fell in love. There is so much history to be found here. 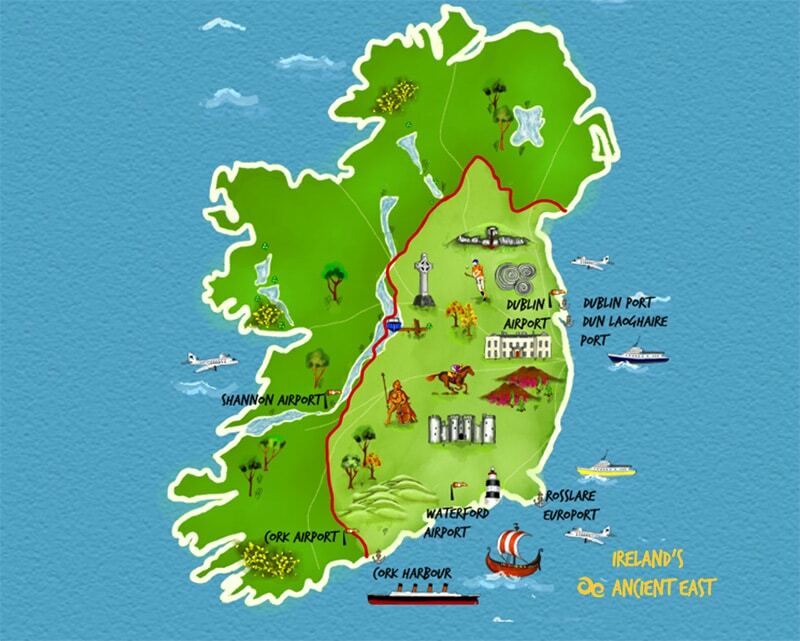 The East is home to the first Viking landing in Ireland, the capital city of Dublin, several major ports, and much more. The capital city of the Republic of Ireland is a great place to start your tour of Ireland’s Ancient East. It offers culture, fun and history for kids! I love this guide from my friend at Learning Escapes. She’s been living in Dublin for over 10 years and has so many great resources for traveling in Ireland with kids and specifically Dublin. 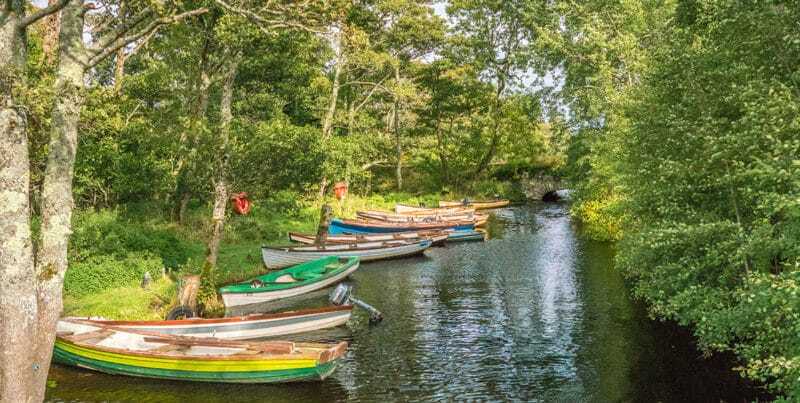 Located just south of Dublin, County Wicklow, known as the “Garden of Ireland” is a beautiful treasure, packed with family friendly fun. In Wicklow you will find the largest of Ireland’s national parks and Powerscourt House. Read this Family Guide to Wicklow for more information. In my opinion, the Ring of Hook is Ireland’s BEST kept secret. You will not see a lot of tourists here for this reason, but you’ll be so glad you made the trip! 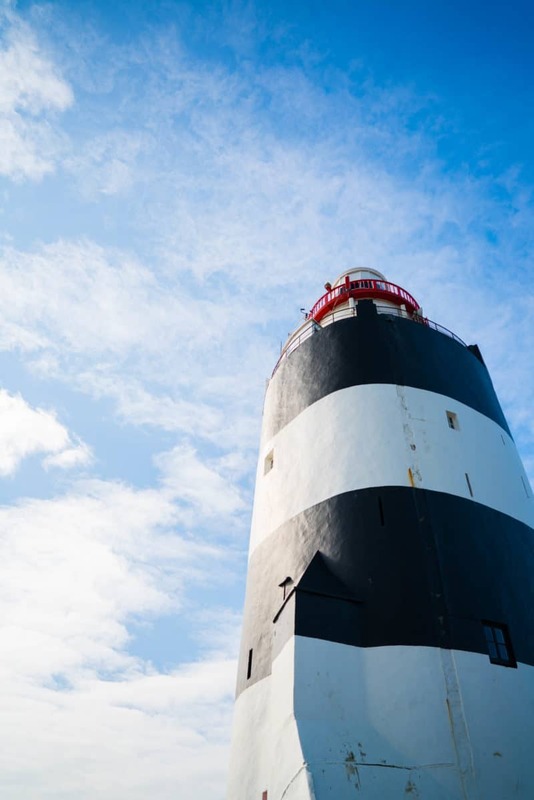 On the tiny ring alone, you can tour the oldest working lighthouse in the world, visit the most haunted house in Ireland, and wander a secret garden and ruins of an abbey. It’s pretty much a kids’ paradise. Waterford is a great place for families. 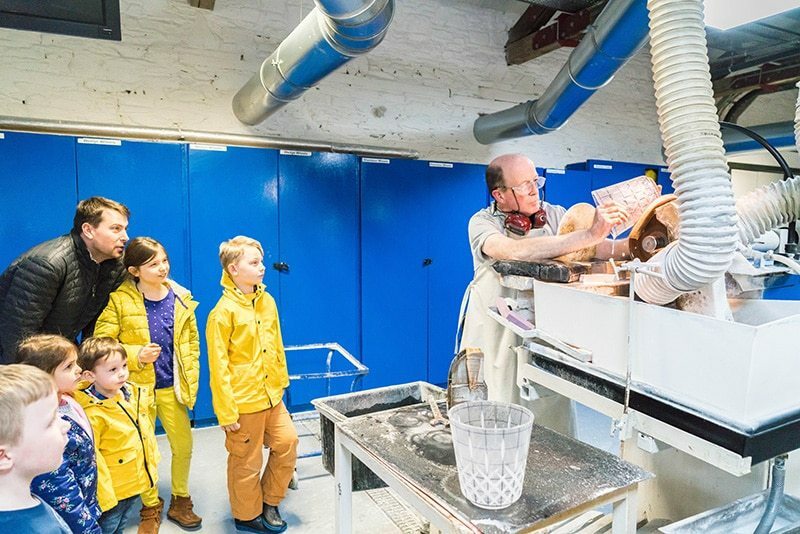 It’s chock full of incredible museums and historic sites including the Viking Triangle, Medieval Museum and the Waterford Crystal Factory, which is so interesting and actually fun for kids! The Wild Atlantic Way is home to some of Ireland’s most breathtaking scenery, including the infamous cliffs of insanity (Cliffs of Moher). It’s going to be hard to narrow down what to do here. Not to be missed are the famous and breathtaking Cliffs of Moher! Yes, they are cliche and a big tourist attraction and they are for a reason! Check the weather before you head to the Cliffs. We went on an “orange” day and honestly, my kids were terrified and I was worried they would blow off the cliffs. So something to be aware of. 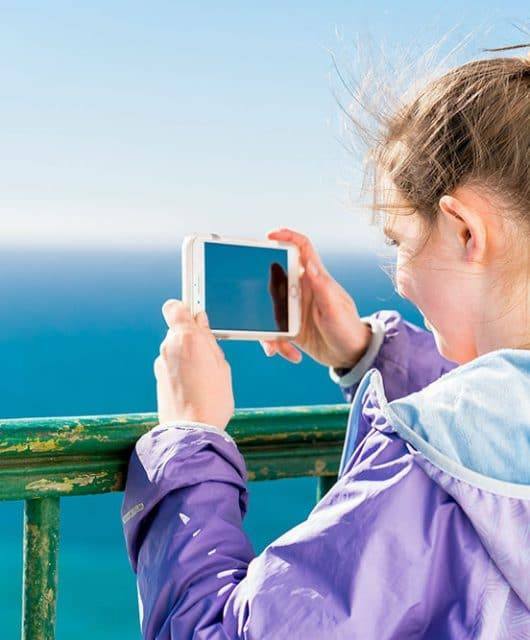 Read this guide for visiting the Cliffs of Moher with kids. The Burren: The word “Burren” comes from an Irish word “Boíreann” which means a rocky place. This is a pretty fitting name because it is covered in Limestone Pavement. It’s like visiting another planet. Read more about the Burren here. The Ring of Kerry’s little, less busy sister, the Dingle Peninsula offers the same stunning views just north. Killarney is so full of fun activities for kids! I would consider this a “must-see” if you’re going to Ireland with kids. Killarney National Park, Muckross Traditional Farms, Ross Castle, Torc waterfall, the jaunting cars and Killarney town all have so much to offer for kids. I’ve written all about Killarney here and I think it’s the perfect Ireland destination for families! As much as I love Dublin, I love Cork 100x more! It’s a fun, bustling city full of culture, fun shops and good food, but feels cleaner and more walkable than Dublin. 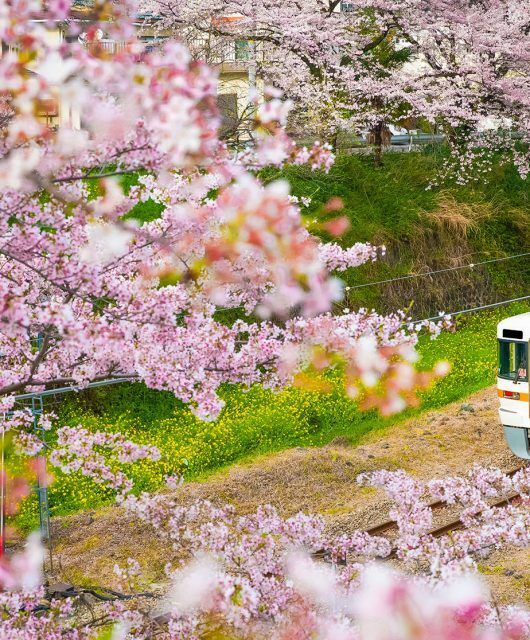 It’s a city that is easily walkable with kids in tow. Donegal, the northernmost county in the Wild Atlantic Way, is worth the drive, with some of the highest cliffs in Europe, it’s wild, beautiful, untouched and hardly ever visited by the majority of tourists to Ireland. Make the trek if you want to see something more unique. The Wild Atlantic Way website has an awesome website with itinerary options by location and duration. Northern Ireland on the north side of the island is a separate country from the Republic of Ireland and is part of the United Kingdom. Though only a small part of the island, it is worth visiting! 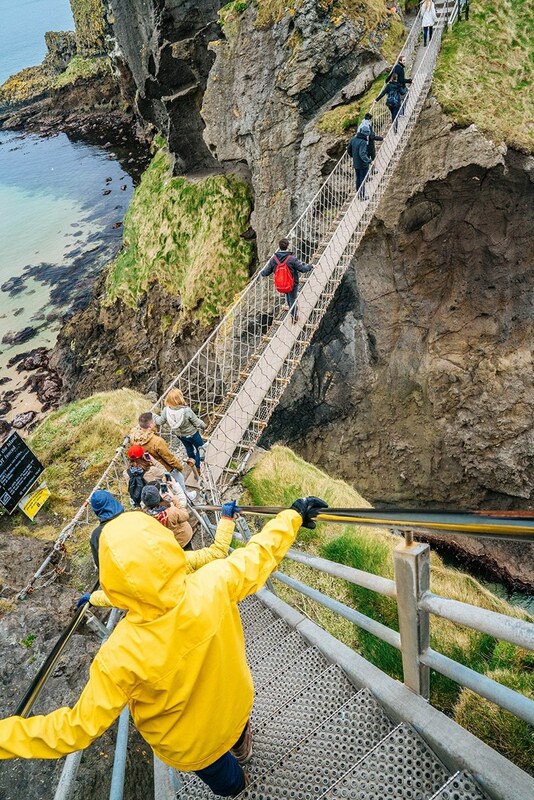 It offers some of the most iconic landscapes in Ireland, such as, Giant’s Causeway, Carrick-a-Rede bridge and Dark Hedges which has been made famous by Game of Thrones. Named as one of Lonely Planet’s regions not to miss in 2018, Northern Ireland is truly a treasure! Remember that Northern Ireland is part of the United Kingdom and will use the pound sterling instead of the Euro. You will not need your passport to cross from Ireland to Northern Ireland. 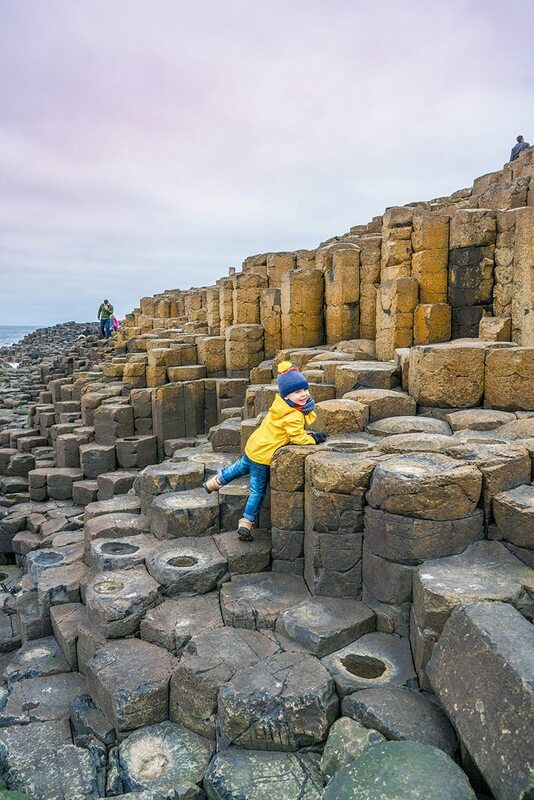 This other-worldly landscape is made up of over 40,000 interlocking hexagonal basalt columns that are basically a giant jungle gym for kids to climb on! Plan on spending a good chunk of your day here as there is so much to explore! I was a little stressed out about my kids falling and cracking their head open on the rocks, but they did ok! This tiny rope bridge connects the mainland to a tiny fishing island. The bridge is suspended nearly 100 feet above the ocean. Beware that once on the island there are no rails to keep kids on the island and it can be quite steep in places. My kids loved running across the bridge and had no problem. It’s about a 1 mile hike to get down to the bridge. 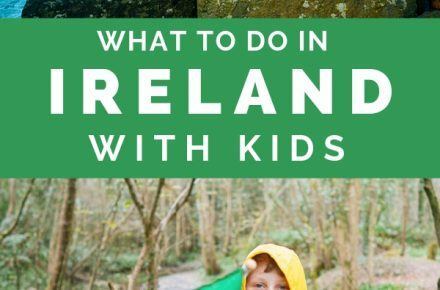 There is so much to see and do in Ireland with kids! For more ideas, check out this list of the best places to see in Ireland. There are many amazing restaurants all over Ireland and I haven’t eaten at them all of course…although now I have my next vacation planned…but I’m giving you a small list of some Irish classics that you must try in Ireland! The food in Ireland is kid friendly and simple. Full Irish Breakfast: Similar to a Full English Breakfast, this will include eggs, bacon, sausauge, tomatoes, mushrooms, beans and toast. A little bit of everything! Soda Bread: This is an Irish classic that we are in love with. It’s a simple, hearty bread that will fill your belly. Be sure to slather it with some good Irish Butter! Irish Butter: Ireland is known for their delicious, creamy butter, made so because of their abundance of grass-fed cows. Hundreds of years ago, butter was used as a currency in Ireland and traded in the markets. This is how Kerry Gold butter got it’s name, not because of the golden color, although the yellow color of butter indicates that the cows are grass fed. 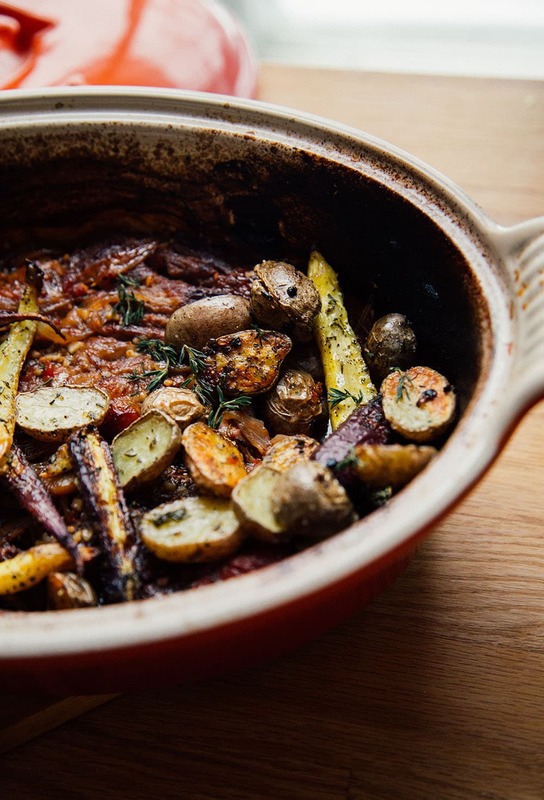 Irish Stew: A traditional Irish meal, Irish stew will contain beef or lamb, and vegetables in a thick tasty broth, served, of course, with soda bread! Fish & Chips: Ireland is an island with over 900 miles of coastline, so it’s no surprise that the seafood here is particularly fresh and delicious. Meat Pies: Beef pie, chicken pie, fish pie are all delicious Irish classics. Pasties are similar, with a pastry on the outside and meat and vegetable filling on the inside, but these can be handheld. Dublin Coddle: An Irish dish traditionally made up off leftovers, Dublin Coddle is a mix of potatoes, onions, sausages and who knows what! Bangers & Mash: A traditional dish of sausages and mashed potatoes. One of my kids’ favorite dishes. Boxty: Boxy is a yummy Irish potato pancake. My kids love this one as well. 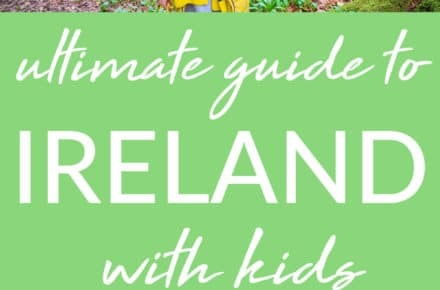 I hope this Guide to Ireland with Kids has been helpful! Our family absolutely adores Ireland and we can’t wait to go back in a few more months! 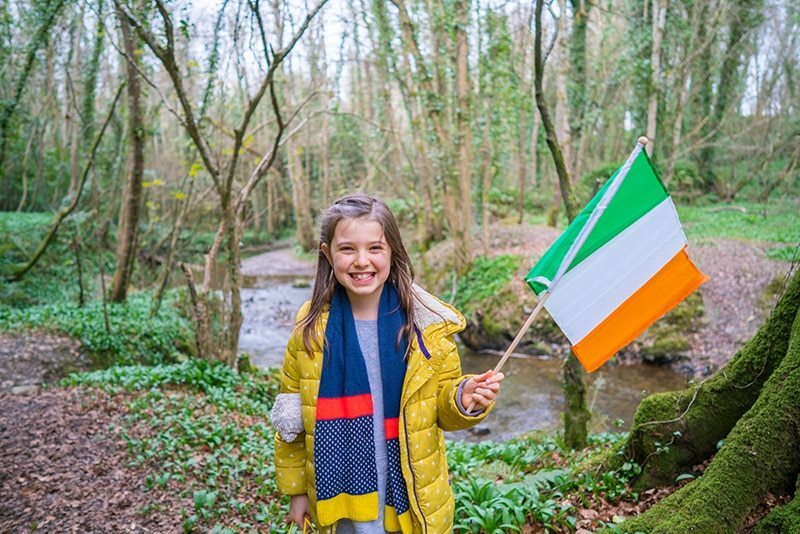 I’d love to know what you decide to do in Ireland with kids so please get in touch with me on Facebook or Instagram, or leave a comment here, I’d love to help you plan your trip! I love your blog posts so much, they’re so helpful! Sounds like your trip was amazing. I had no idea flights from the U.S to Ireland were that cheap, and the $370 from New York has me hooked. I hope to visit soon! Hello there, what do you think about trace mobile number location? Really awesome idea, huh? Thank you so much for discussing the idea, I saved the webpage. I am also seeking details around vpn router, are you aware exactly where I might come across one thing such as that? I’ll be back soon! There is fantastic changes on the design of this website, I certainly enjoy it! My site is dealing with best on ear headphones and there are lots of things to do, I’m still a novice in webpage design. Cheers! Skype has opened its web-centered customer beta for the world, soon after introducing it extensively from the U.S.
nevertheless, all those need a connect-in set up). I was talking to a buddy of my own about this info and also about upvc front doors as well. I believe you made a lot of great points in this article, we’re excited to continue reading stuff from you. Can I just say what a relief to locate a person who truly knows what theyre talking about on the net. You definitely know the best way to bring an issue to light and make it critical. Extra folks have to read this and fully grasp this side of the story. I cant believe youre not much more well-known since you unquestionably have the gift.